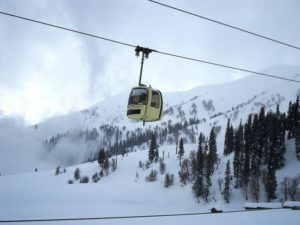 After a cable car crashed, 4 were injured and 2 were killed, the accident happened during a mock rescue drill in preparation before being inaugurated by PM Modi, this was a part of the Jammu Ropeway Project. A police official said this crash happened due to a technical error that occurred near the Mahamaya Temple. The Agency that was responsible for its safety was doing a mock rescue drill, and when an imbalance in the cable car occurred, one fell down that had 6 workers in it. A 45- Year-Old from Bihar died right on the spot, he was identified as Rakesh Kumar later on. Hari Krishan, Manjeet Singh, Lovely, Ravinder, and Engineer Balkirat Singh were rushed to the hospitals to give immediate medical attention. But, 45-Year-Old Hari Krishan passed away in the Hospital. Governor Satya Pal Malik of Jammu and Kashmir has instructed officials to conduct an inquiry of the said incident, he also announced a cash relief of Rs. 5 Lakhs to those family members who lost their loved ones. Governor Satya Pal Malik has ordered the Jammu and Kashmir administration to give the injured free medical treatment. Khurshid Ahmed (Advisor) and BVR Subramanyam (Chief Secretary) were instructed to visit the injured men at the Hospital by Governor Satya Pal Malik. Prime Minister Modi is set to inaugurate the Jammi Ropeway Project on February 3, 2019. This is done to help them boost the tourism in the region. Basically, the project has two phases which are from Bahur For to the Mahamaya Park, and From the Mahamaya Park to the Peer Kho, this covers 1,118 meters. Farooq Abdullah the National Conference President, and Omar Abdullah the Vice President have both described the incident as tragic and unfortunate, they also expressed their griefs over the death of the 2 workers.